The next one - for you! Perfect-Pink is the most beautiful neon pink shade in the color spectrum. Our Perfect-Pink cable sleeving color is spot on and extremely fluorescent at UV-blacklight. The fluorescent properties also add an extra intensity boost under natural daylight. Perfect-Pink was created to change the public opinion about pink. The truly self confident people will use it first and others will follow. Who dares, wins! Enjoy the spectacular new designs, which you can create with Perfect-Pink cable sleeving. Of course it is - as always - 100% made in Germany at the MDPC-X manufaktur. A class of its own in color and manufacturing quality. 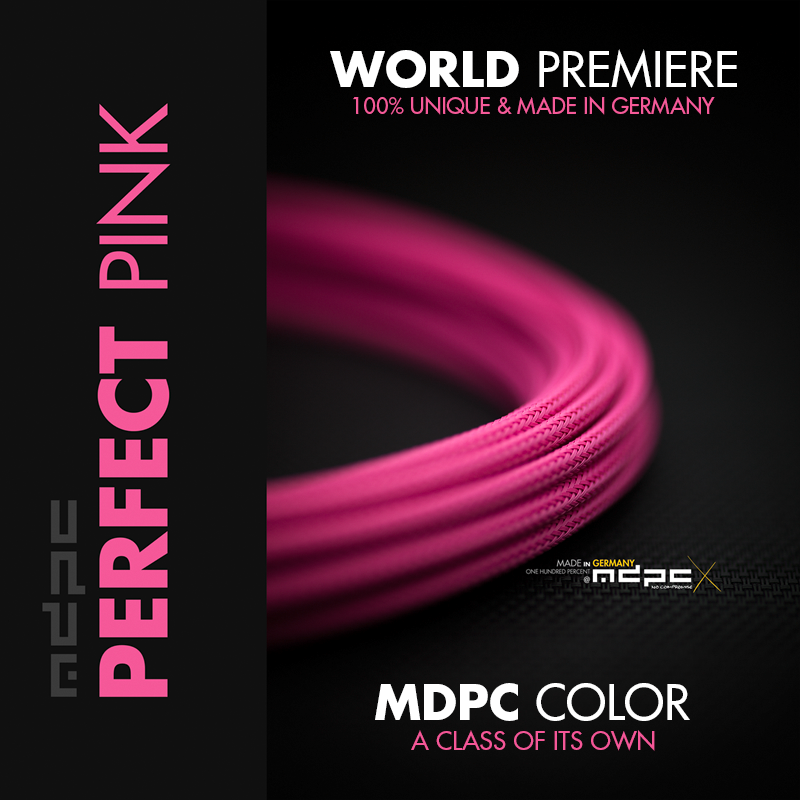 Perfect-Pink Cable Sleeving by MDPC-X: The next 100% unique color on this planet, only by MDPC-X Germany, 100% made in Germany. More and more professional sleeving services drop their chinese materials in order to switch to MDPC-X, even professional sleeving services in Asia. Constant quality in every aspect and advantages in usability through expandability and the resulting rigidity (elimination of all wobbles in a wire even on longest distances) are only two of multiple reasons for the independent professionals to choose MDPC-X over anything else. "No compromise" is our trademark philosophy since 2007 and we always deliver what we promise since then and we will do so in the future. Get the new Perfect-Pink cable sleeving by MDPC-X now! You can order Perfect-Pink directly from us and of course you can also get MDPC-X Cable Sleeving products in even smaller quantities and directly in your continent / country through our global MDPC-X Stores. Perfect-Pink is available as SMALL cable sleeving and as MEDIUM cable sleeves.